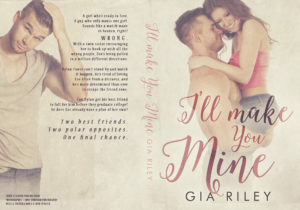 I’ll Make You Mine is LIVE on Amazon and Kindle Unlimited. A girl who’s ready to love. A guy who only wants one girl. Sounds like a match made in heaven, right? Zoe’s being pulled in a million different directions. Dylan Tuner can’t stand by and watch it happen. and he’s more determined than ever to escape the friend zone. Can Dylan get his best friend to fall for him before they graduate college? Or does Zoe already have a plan of her own?